In order to celebrate OPCF’s 19th Conservation Day, we’ve created the first-ever visual identity for the event and produced a series of promotional materials. 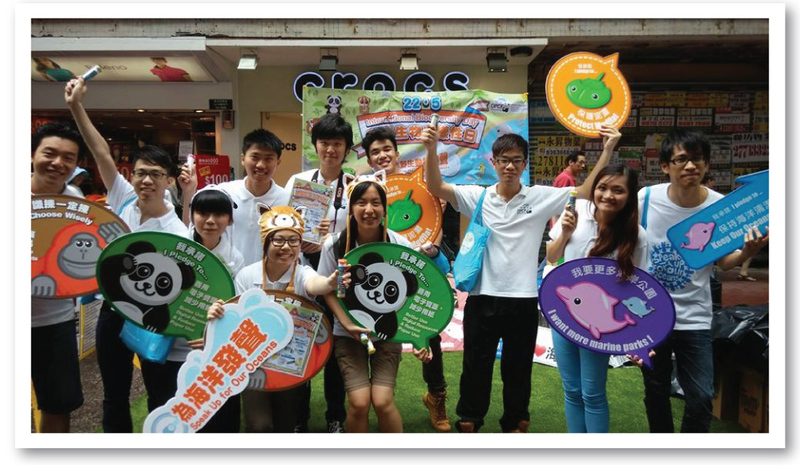 We also helped OPCF organised a pop-up roadshow in Mong Kok on International Biodiversity Day to raise public awareness about endangered animal conservation. The logo is designed to represent the Conservation Day, an annual event of Ocean Park Conservation Foundation. This is the first logo ever for this event, and it can be tweaked with a new theme and used for future Conservation Day. Attractive graphics are often good attention grabbers. A series of promotional materials (e.g. banner, photo-taking props, and game instruction board) were designed and produced for OPCF to set up a roadshow booth in Mong Kok to celebrate International Biodiversity Day, which is a great successful event, sponsored by M&M’S® and Liveturf. An infographic with 3 simple conservational messages to protect Chinese white dolphin, seahorse, and horseshoe crab are illustrated on a souvenir fan. This has turned a branded recycled plastic fan to a meaningful, educational tool.